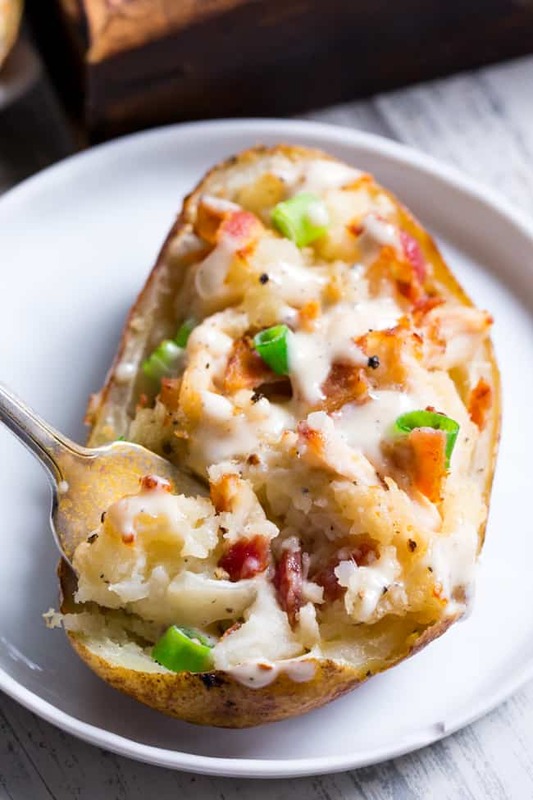 These savory and healthy twice baked potatoes are loaded up with a creamy chicken caesar filling plus bacon and scallions that will have you craving them constantly! They’re dairy-free, paleo, and Whole30 compliant. Great as a side dish or full meal. Perfect to prep ahead of time too and easy to reheat! I totally have a love-hate thing going on with twice baked potatoes and sweet potatoes. You see, I actually LOVE them, really I do. The crispy, creamy, savory deliciousness is just way too good to NOT love, don’t you think?! 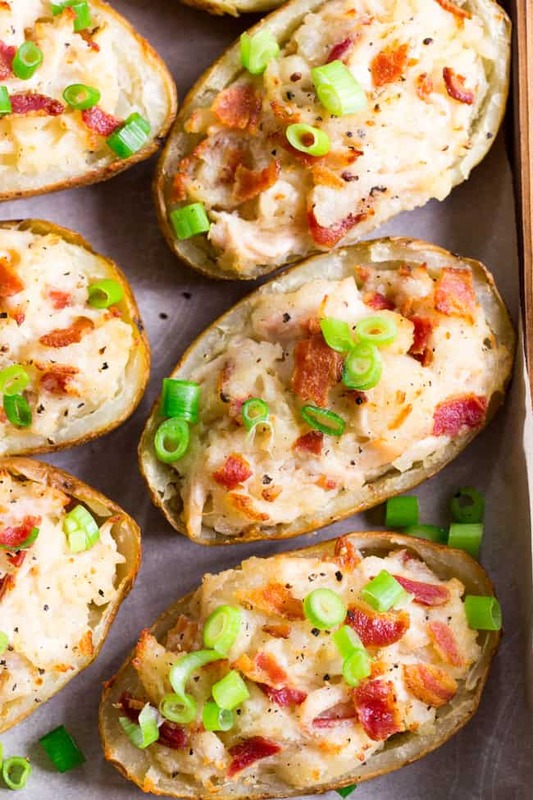 Whether we’re making my spinach artichoke twice baked potatoes, sausage pizza twice baked sweet potatoes, or now these ridiculous (in a good way) chicken caesar twice baked potatoes, there’s just no resisting them, period. Okay, so why the hate part? Well, I can’t lie, twice baked potatoes can be a big pain to make. Not actually difficult, just a time consuming, multi-step process, and, as we all know – time is not something most of us are happy about giving up. Because of that, I decided to cut a few corners with these potatoes, as well as give you the option of “semi-homemade” (you’ll see!). And yes, now with lots of Whole30 options, semi-homemade Whole30 is actually possible – woohoo! Now for those of you who want homemade-homemade, you have that option here as well! I’ll explain in just a moment. So, chicken caesar – obviously there’s some sort of caesar dressing going on in here. If you’re new to Whole30 and Paleo and haven’t tried out Tessemae’s dressings and sauces yet – you must! While I do love making my own sauces, I’m also human and need to rest sometimes, and the Tessemae dressings are game changing for sprucing up those Whole30 meals. 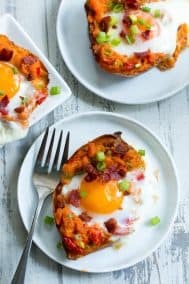 I also recommend making these with either leftover cooked chicken or even a Whole30 compliant rotisserie chicken to cut down on cooking time. 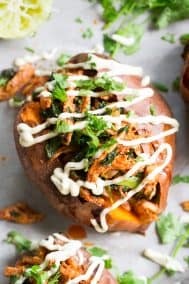 If you prep shredded chicken to use in meals throughout the week that would also work really well for these twice baked potatoes, since you’re using a relatively small amount of chicken here. And now we come to…the bacon! 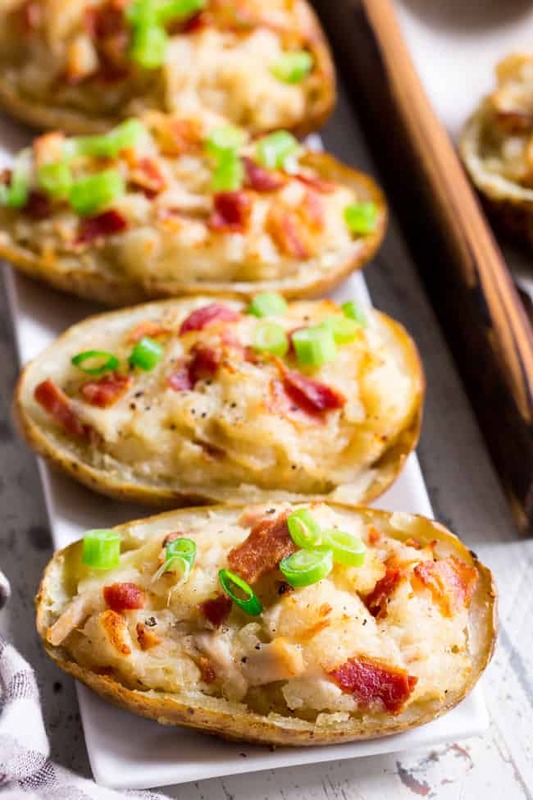 While there’s no semi-homemade option for bacon, I had to add it anyway because in my mind, twice baked potatoes NEED bacon! I recommend cooking it ahead of time so you can easily throw it into the mix when you’re ready to bake the potatoes for the second time. So what else in in the mix here? We have chicken, bacon, creamy caesar dressing, mashed potatoes, ghee, and non-dairy milk to get these nice and creamy. You can use either unsweetened almond milk or coconut milk – the flavor won’t be affected. After baking for the second time, I sprinkled additional bacon on top along with thinly sliced scallions. If you want, you can also drizzle more caesar dressing on top for extra flavor – you can see this in some of the photos. Finally, I HAVE to mention that as leftovers these potatoes held up so well! You can actually make them start-to-finish, freeze them and heat them up in the oven without any issues at all. They’ll also keep well in the refrigerator for up to 4 days. 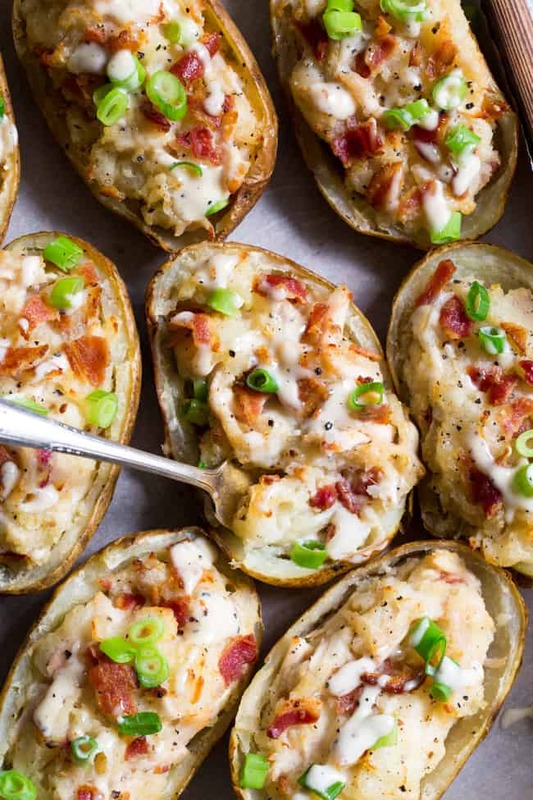 I think we’re ready to begin – I know you’re going to love these Chicken Caesar Twice Baked Potatoes – let’s go! 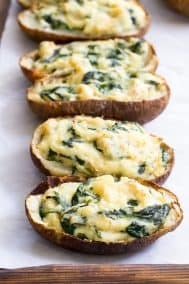 These savory and healthy twice baked potatoes are loaded up with a chicken caesar filling that will have you craving them constantly! They're dairy-free, paleo, and Whole30 compliant. Great as a side dish or full meal. Perfect to prep ahead of time too and easy to reheat! Once cooled, cut each potato open lengthwise and scoop out the inside, leaving a thin layer. Mash the insides of the potatoes with the ghee, milk, caesar dressing, lemon juice, sea salt and pepper. Mash well until the texture is relatively smooth. Add in the shredded chicken and bacon, leaving some bacon to sprinkle over the top. Scoop all the mixture evenly into the 8 hollowed potato halves. Bake at 400 for about 15-20 minutes or until beginning to lightly brown. Remove from oven, garnish with scallions and more bacon if desired and serve hot. You can also drizzle on more caesar dressing for extra flavor. Store leftovers in the refrigerator for up to 4 days - they reheat in the oven or toaster oven really well! 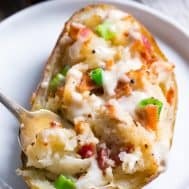 **If you're short on time, bake the potatoes ahead of time and store in the refrigerator until ready to proceed with the recipe. 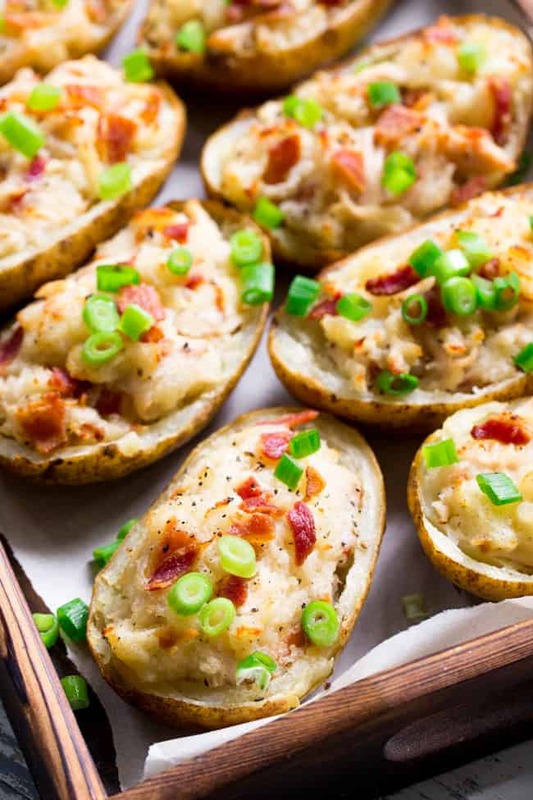 ***You will fill all 4 potato skins so make sure you only discard the scooped-out inside of the 4th one. Want More Whole30 Potato and Sweet Potato Recipes? Try One of These! These look absolutely delicious! Love the idea of using store-bought dressing to save a bit of time too. I’ve seen that brand in the store before but haven’t tried it yet…now I need to! Love your recipes and I’m trying this one tonight (with some Sir Kensington’s Lime Ranch because I’m out of Tessemae’s 🙁 ) Smelling absolutely divine in the oven right now! This is the best recipes. Today I will eat this food. Thank you so much for the share. Were can I find a list of food to eat and not eat on the Paleo Diet? Thank you so much for share this post. I like the chicken item too much. now I will try to make this new item for me. Thank you so much for sharing this post. Hi! I was just wondering, I thought normal russet potatoes were not paleo? Sweet potatoes can be paleo in moderation but to my understanding normal potatoes are not. Can you help? These were delicious! We slow cooked a ton of chicken for multiple recipes and it was perfect for this one. 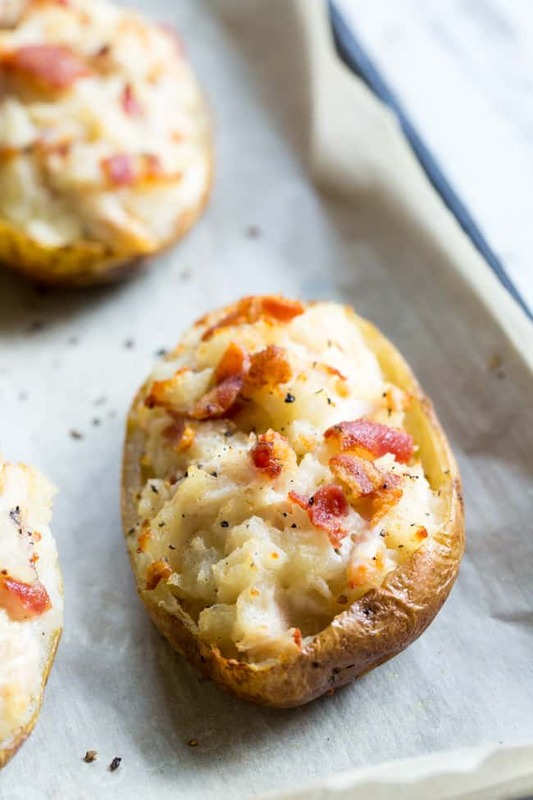 Next time we will add more bacon and make potatoes a head of time. Well worth the effort.